Separate the tentacles so that you have bunches of three or four tentacles stuck together. Then cut open the squid body by making a vertical cut through one side of it. Open up the body, lay it flat, and make shallow diagonal cuts across the inside of the body in a criss cross or diamond pattern. Then cut the body into a few, even sized, rectangular shaped pieces, approximately 2″ x 1″. Pour vegetable oil, at least 3 inches deep, into a wok. Heat this over medium heat until the temperature of the oil reaches 375 F. While you’re waiting for the oil to heat up, place the potato starch in a shallow bowl and stir in a pinch of salt. Mix together the salt, white pepper and black pepper in a small bowl and set aside. Working with one or two pieces of squid at a time, coat them well with the potato starch and gently shake off the excess. Place the coated pieces on a plate in a single layer and set aside. Repeat until all of your squid pieces and tentacles are well coated in potato starch. Cook the squid body pieces and the tentacles separately as they will require different cooking times. Do not overcrowd the oil, so you may need to deep fry in two or three batches. Be sure to bring the temperature back up to 375 F between batches. When the oil is hot enough, gently place your squid into the hot oil and deep fry until the pieces curl, turn golden brown, are cooked through, and are nice and crispy. This will take around 4 minutes. (Personally, I always deep fry a single test piece first. That way, I’ll know what signs to look for when the squid is ready, I can adjust the temperature of the oil if necessary, and I’ll know how long I need to deep fry it for.) Don’t overcook the squid. Use a Chinese wire strainer or a slotted spoon to strain out the squid pieces and transfer them to a paper bag lined plate. Immediately sprinkle over a pinch of the salt and pepper mixture. Repeat with the remaining squid and tentacles. When all of your squid pieces and tentacles are deep fried, immediately toss the garlic into the hot oil to flash fry it. Strain out the garlic pieces when they are browned and crispy; this will only take a few seconds. 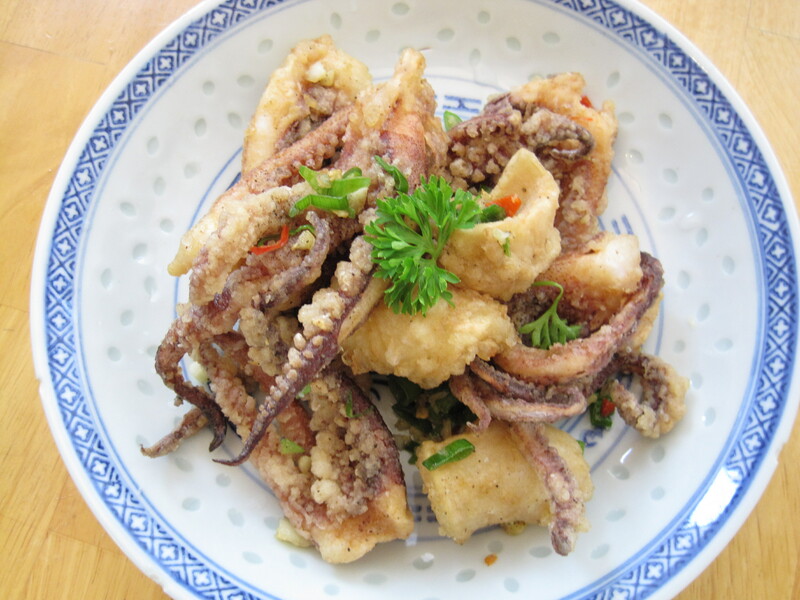 Then immediately toss the squid into a heat proof bowl along with the red chili pepper, deep fried garlic, green onions, and the rest of the salt and pepper mixture. Toss gently to mix everything together. Dish out and garnish with curly parsley if desired. Serve immediately with white rice. Hi, the squid turned out really good. I kicked it up a notch with a Jamaican twist. I added some scotch bonet pepper…Ooooo the burn. Thanks again for your link…mmmm what to try next. Thanks so much for your comment and thank you for trying my recipe!